New partnership allows developers the option of geo-distributing their STUN/TURN servers through Xirsys’ global network with just one line of code in IceLink or LiveSwitch. Frozen Mountain and Xirsys have teamed up to provide new STUN and TURN server hosting options for IceLink 3 and LiveSwitch. "This integration with Xirsys allows IceLink and LiveSwitch developers to use Xirsys hosted servers with just a single line of code,” states Anton Venema, CTO at Frozen Mountain Software. 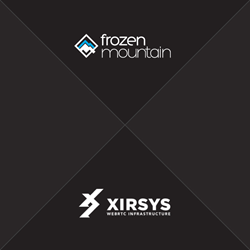 Frozen Mountain Software and Xirsys are pleased to announce the availability of new software libraries for simple integration of Xirsys hosted STUN/TURN servers with applications running Frozen Mountain’s award winning IceLink and LiveSwitch WebRTC products. This partnership provides WebRTC application developers a new option for intelligent geo-distribution of their STUN/TURN servers when leveraging Frozen Mountain’s powerful SDKs and server components. Frozen Mountain, a leading provider of WebRTC based products and services, has partnered with Xirsys, a WebRTC infrastructure and cloud platform provider, to bring a new option for STUN/TURN server hosting in applications built on Frozen Mountain’s IceLink SDK and LiveSwitch server components. Session Traversal Utilities for NAT (STUN) and Traversal Using Relay NAT (TURN) are key protocols required in all WebRTC based applications. Providing a reliable method and infrastructure for network clients to locate each other behind complicated firewalls is crucial to the successful implementation of all WebRTC applications. Started in 2008 and having grown to over 300 customers in 51 countries worldwide, Frozen Mountain Software provides cross-platform, licensed Internet Based Real-Time Communication (iRTC) solutions and services that allow organizations to incorporate WebRTC audio/video streaming, selective forwarding, audio/video mixing, screen sharing, call signaling, telephony, broadcasting, text chat, shared whiteboards, browser synchronization and internet pub/sub messaging into their applications. Learn more at http://www.frozenmountain.com. Xirsys is a WebRTC infrastructure platform that provides hosted and on-premise solutions for NAT traversal, signaling, real-time & persistent data, and media server processing & delivery. Created specifically for WebRTC application and service providers, Xirsys’ technology is built upon a proprietary distributed architecture which provides advanced reliability, scalability and extendability. Companies can use Xirsys technology as a fully managed cloud service and API or installed on-premise for complete end-to-end control. Xirsys is privately held and headquartered in Santa Clarita, CA. Learn more at http://www.xirsys.com.